No matter whether you are pro or a novice, if you are a computer user, then you must have faced the issue called virus attack. Computer virus is a malicious software which hinders in the normal operation of your PC. Some of them cause data damage while others prevent software from performing normally. If you are unlucky enough, then your computer might get infected with a virus that has a capability of stealing sensitive information. In this post, we are going to discuss top 7 computer viruses that you need to avoid at all cost. It is a computer virus which comes with the capability to stores itself within the memory of your machine to allow the infected files to infect other files. A resident virus is one of the strongest virus that can easily infect the files on your machine when the originally infected program is already terminated from the computer. Resident virus uses different programming of the virus so it is not only too complicated to detect the virus but also difficult to eliminate. For the better understanding, it can be divided in two ways as fast and slow infectors. Fast infectors are those viruses which can cause damage swiftly and it can be easily identified. Wherein slow infectors develop their symptoms very slowly and that’s the reason it is very difficult to identify. Spacefiller Virus is also known as cavity virus. 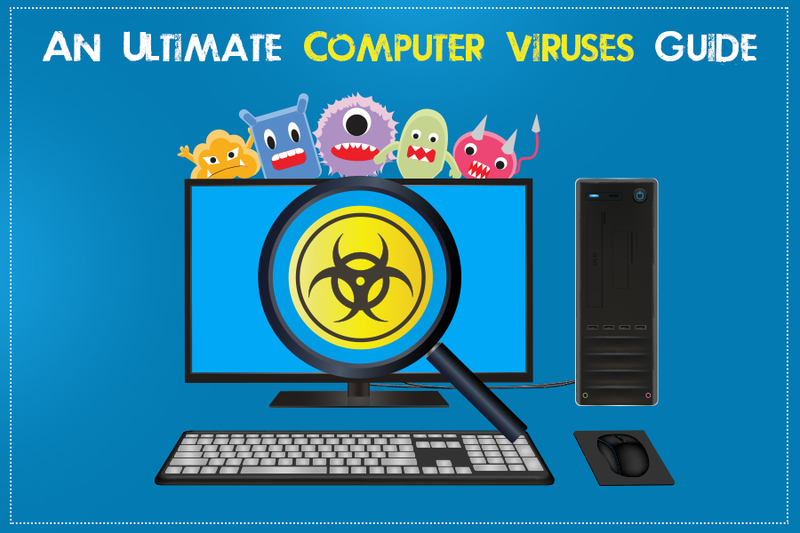 It is a sophisticated virus which is considered as a most intelligent virus as compared to its counterparts. Moreover, it is a rare type of computer virus that install into files by itself with the aim of filling the empty sections of a file. As the virus uses the empty section to infect the files without modifying the files size that’s why it makes more difficult to detect Spacefiller virus. A polymorphic virus is a known as a complicated computer virus that focuses on affecting the stored data types and its functions. This virus is a self-encrypted virus which is specially designed to evade detection by antivirus tools and scanners. Moreover, this virus creates replica itself by generating usable, albeit slightly different from one another. A polymorphic virus can create duplicate constantly so it is not easy for anti-virus programs to detect it smoothly. Multipartite Virus is considered as one of the fast-moving viruses that instead of attacking one component of a machine at a time it attacks on two. Multipartite Virus is the virus that target the system as well as the boot sector at the same time. In the simple words, it can be defined as the dual infection approach which has the capabilities to re-infect the same system repeatedly till the time when the components of your system are not entirely destroyed. It is also known as a hybrid virus. It is a computer virus which is written in the same macro language that is used for the software programs like Microsoft Word and Excel. Macro Virus is a set command which is often used for repetitive tasks and automating common. When your computer is getting into the hands of a macro virus and infects a software app then it triggers a sequence of actions to start automatically at the time app is opened. This virus can affect all the platforms like Mac, Linux and Windows. An overwriting virus is a kind of virus that copy its own codes over the computer data which can easily eradicate the authentic programs. That means the original code is eliminated and replaced by new codes or malicious code. As the overwriting viruses eliminate the original file either completely or just the part of so it is not possible to disinfect the files later. The only way to restore the deleted files I to restore the files from a backup. But please keep in mind, this virus can be eliminated by getting rid of infected files from your computer. It is a virus that focuses on attacking or starting to work instantly. A direct-action virus contains nonviolent and fewer repeatedly violent activities that aim groups, individual, or property deemed offensive to the direct-action participants. In other words, direct action virus is the non-resident virus that doesn’t believe in installing by themselves and choose to stay concealed in your computer’s memory to infect other files. So, these are the top 7 computer virus that you need to be careful from to keep your machine safe and secure. Well, using the anti-virus software is one of the best solutions to ensure the protection of your data and sensitive information which is stored in your machine. If you know any other type of virus, please feel free to share your knowledge in the below comments box.